Congratulations to Her Royal Highness The Duchess Cambridge and The Duke of Cambridge on the birth of their baby boy! I couldn’t resist sharing this patriotic picture to mark the occasion! 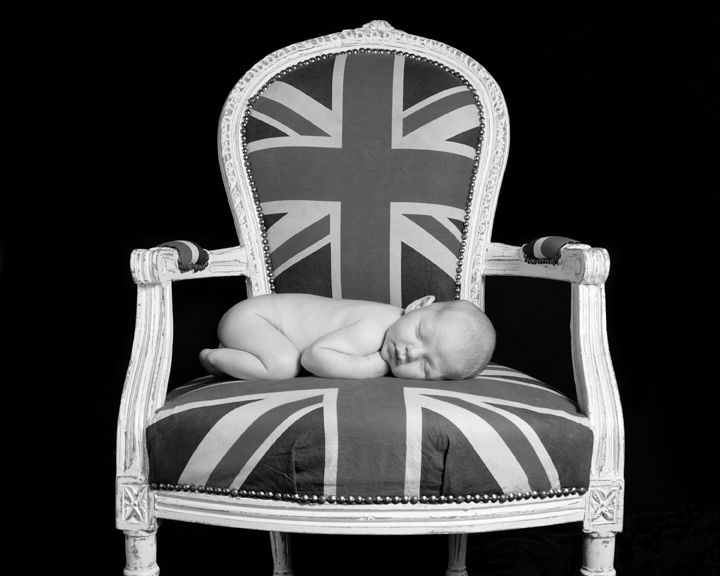 This little cutie was photographed on his Mummy’s Union Jack chair. To celebrate their baby’s arrival and with a nod to the Queens Diamond Jubilee in 2012! It remains one of my firm favourites and my new Client’s always ask if we can recreate it. It is a very striking image and it looks even more beautiful in print. I am always happy to incorporate props and items from my Clients home in their portraits. Provided that they will work in the photograph. I recommend that ideas are discussed with me before the photoshoot. This is to ensure that it will work with my style. I provide advice on guidance throughout the photoshoots. Both before and during to help get the most out of each photoshoot. A family of 3! What’s your perfect number? I was enjoying listening to all the radio call in’s today whilst travelling home from my photoshoot. I am actually the youngest of three girls. For us 3 really was the magic number. We are all close and our parents ensured we all felt equally loved. I know it isn’t easy though in no way shape or form! We’ve decided to stop at two children but more and more of our friends and my Client’s are going for number 3! It’s the last baby, the final little darling to hold and cherish and why not! So many callers commented that after 2 one more makes little difference. Of course it is different for everyone but I’m sure the Royal family will manage just fine. With a Royal wedding to look forward to next month as well, it’s going to be an exciting year for the Royal family! Now it’s time to get back to my two, bathtime, bedtime and perhaps time for a me to have a quiet cup of tea in between! This entry was posted in baby photographer, Baby Photographer London, Baby photography, baby photography london, childrens portraits, family portraits, maternity photography, Newborn Photographer Brockley, Newborn Photographer Canary wharf, Newborn Photographer Dulwich, Newborn Photographer Fulham, Newborn photographer Greenwich, Newborn Photographer London, Newborn Photographer South London, newborn photography, newborn Photography Chislehurst, newborn twin photography, NewbornPhotographerChelsea, North London Baby Photographer, Pregnancy and Newborn Photographer Primrose Hill, pregnancy photographer, Pregnancy Photography Chislehurst, Royal Baby, Royal Photographic Society, South London Baby Photographer, West London Newborn Photographer, West London Photographer and tagged Royal Baby.